Safety is essential when working with lasers due to the risk of laser damage. 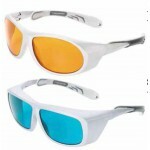 We offer a range laser glasses. Cleaning optics, both in laboratories and industrial environments, would ensure the best use of optics, especially when laser light is involved.